I have just done a classical guitar test and one of my comments was not to put my right hand on the guitar table. Can anyone tell me what it is, i am just using a standard classical guitar and no google results say what it is. I am guessing it is just near the bridge but if i am wrong plear correct me. 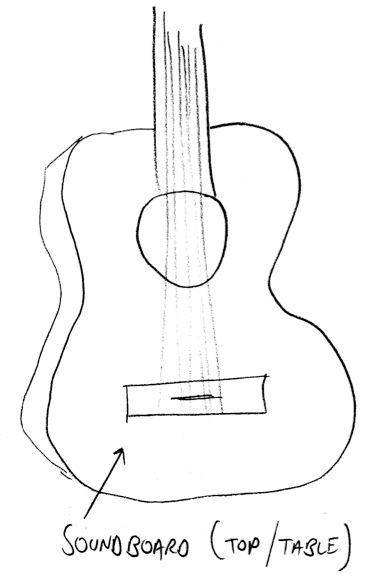 The top of an acoustic guitar (steel-string or classical) is also referred to as the table. This is the flat piece of wood making up the front of the guitar's body when in playing position (which is a bit confusing!) It is the flat piece of wood which has the sound-hole in it, and which has the bridge stuck to it. This part of the guitar is also called the sound-board or face. When playing with a standard classical guitar technique, it is best not to rest the right-hand or any of the right-hand fingers on the table, as it restricts the hand's movement, making it difficult to play all of the strings easily with the thumb and fingers. Not the answer you're looking for? Browse other questions tagged classical-guitar classical-music or ask your own question. Should I look at my fingers or look at the music? What are the advantages of Narciso Yepes' 10 stringed guitar? My guitar pupil is a pregnant woman. Should she keep playing classical guitar? So I want to start playing again. But not right now, in a while. Some pieces and advice?